This week is all about brands I love, and when I think about Two Moms in the Raw, I can safely say they fit in this club. I discovered Two Moms in the Raw when mindlessly waiting borded for my husband to pick out his many cereals from the cereal aisle at Mariano's. He basically lives on toddler food like Cheerios and Chex. Since I don't eat grains, this aisle is usually a waste of my time, as are most of the interior aisles at the grocery store. But this particular day I picked up a box of this intriguing Two Moms in the Raw grain-free cereal and read the ingredients. I was shocked that the ingredients were so simple and all thing I could eat! It basically reads, organic sunflower seeds, organic banana, organic almonds... you get the idea. Every one of Two Moms in the Raw products are 100% organic, raw, vegan, free of wheat, dairy, soy, refined sugars and gluten free! In our house, this cereal is call "Jill snacks" because it's pretty much the only food in our house that come from a box, and that I didn't cook myself. If you are looking for snacks you can feel good about eating, you must try them out. My local Mariano's and Whole Foods carry almost all of their snack options. 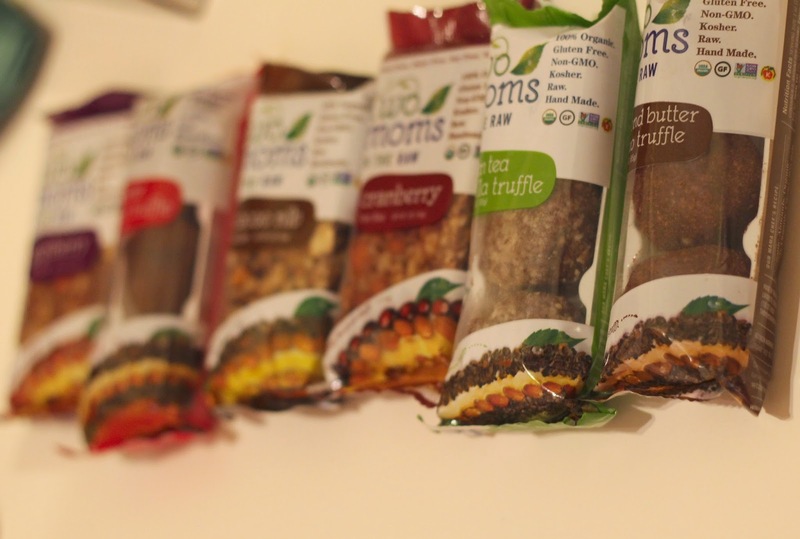 Two Moms in the Raw were kind enough to send me a whole box of goodies so I could get familiar with all their tasty and healthy treats! I fell in love with their new Cacao Nib Nut Bar, which is basically like a guilt free adult chocolate chip granola bar. The Goji Berry Nut Bar was pretty amazing too. I also loved the Garden Herb Sea Crackers. Check them out for yourself and maybe even pre-order their cookbook that is out May 5th! You're always inspiring me to go more grain-free with my foods! I eat terribly and should really focus more on the vitamins and macros of the things I put in my body.